Maybe I'm going a little blind. Is it just me or is becoming harder and harder to understand the graphics used for F1 coverage these days? I've been slow to bring this one up because I like to think I'm fairly tuned in with F1 and perhaps I'm displaying my shortcomings now! Ever since the points system changed from awarding the top 6 positions there has been a lot of chopping and experimenting with different layouts for graphics. When there were just 6 cars getting points it was easy because FOM (the TV producers for F1) could fill half the screen making the names and splits very easy to read. Remember the big blocky yellow numbers? (Ah memories!). Then points were awarded to the top 8 and now the top 10. That's fine but then FOM starting abbreviating. Now ask the casual F1 punter on the street what "HAM" and "BUT" mean and a lot of them will guess correctly at Hamilton and Button. It's further down the grid where things get messy. "LIU" anybody? "YAM"? 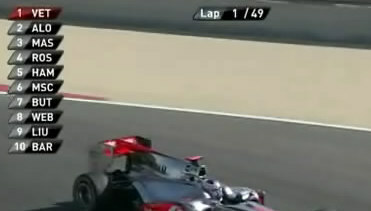 With the F1 grid now jammed with 24 cars FOM will need to be more creative when it comes to giving details on the race. They need to find a way of giving the full name of the driver order in a font that's big enough to actually read. Back in the day they would simply cycle through 6 drivers at a time until all places were known. Then they'd show splits between the 2 drivers who were fighting each other on track. Now it's just a bit of a mess really. Another irritation is the use of the artificial rev counter and g-meter. This works fine during a fast solo lap but when there is an incident happening the large blot just covers up what we're trying to see especially at the start of a race. On the other hand I have noticed a positive. They've changed the lap counter to read up instead of down. I don't know why but I just prefer the thought of a race building lap by lap to a crescendo as opposed to literally counting down the laps until it's over. So please FOM fix it or else send me some glasses.